CEE Attorneys is an international law firm with presence in Europe and partners’ bureaus in Asia. CEE Attorneys was started in the beginning of 2015, when two law offices – one Czech and one Slovak – signed a partnership agreement in order to ensure a full range of top quality legal services for their clients in both countries on the same conditions and under the one-stop shop principle. That was the reason behind the decision to operate under a single brand name. Since then, the number of legal partners of CEE Attorneys has been steadily increasing across the CEE region along with the growing demand for high-tier legal services in the area. That prompted the need for closer ties between the partners and resulted in the consolidation of national offices. CEE Attorneys have a professional civil umbrella insurance totalling EUR 7.4 million and covering all national offices. In 2017, the management structure of CEE Attorneys was changed: part of the functions that had been carried out by managing partners of the national bureaus, were transferred to a newly elected management bodies – Board of Directors and Expansion Director. Zdenek Tomicek, Founding Partner of CEE Attorneys and Director of Expansion, is responsible for expanding full-scale legal services in the Central and Eastern Europe as well as other countries that are of high interest for the CEE Attorneys clients. The three CEE Attorneys board directors are the Lithuanian partner Daina Senapėdienė, the Hungarian partner Tamas Bellak and the Czech partner Lukas Petr. Daina manages research and development activities, including improving processes and internal systems. Tamas is in charge of international client’s search, participation in international tenders and expansion of other business possibilities. Lukas is responsible for marketing strategy implementation and its coordination between respective offices, public relations as well as social media. The new identity of CEE Attorneys defined the need for a new slogan to embody our philosophy and attitude towards the client: WE FOCUS ON THE FUTURE by helping your business to create it. Most business consultants say their strength is their capability to look from a different perspective. We have that, but our utmost merit at CEE Attorneys is often the opposite. We are the rare kind of lawyers who look at things from the perspective of our client’s goals and needs. We are looking in the same direction with businesses, accompanying them all the way from choosing the proper business model to implementing the most advanced technologies. That direction is the future. That is why we have fintech start-ups and market innovator cases in our portfolio, and our renowned experts are often the members of our clients’ boards of directors. CEE Attorneys specialise in corporate and M&A, TMT, real estate and construction, banking, finance and fintech, litigation and arbitration, public sector and employment issues. Our portfolio includes cases ranging from multi-million euros corporate mergers to fintech start-ups’ advising. 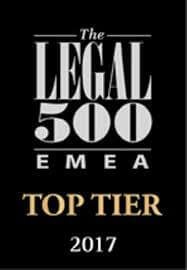 In the last few years, CEE Attorneys have been recognised by The Legal 500 EMEA as a top-tier legal practice in several areas. The areas of our expertise that have received international acknowledgment are: commercial; corporate and M&A; real estate and construction; dispute resolution and TMT.